"We demand a happy ending; not, as many critically assert, because we are confirmed sentimentalists, but because of the hope and determination that is the distinctly American heritage," wrote artist Art Clough in a 1937 letter to University of Oregon librarian M. H. Douglass. "It seems to me to be the ONE characteristic that sets us apart from all other peoples—and times." Clough was describing to Douglass the genesis of his idea for the six huge, carved, white cedar panels that have hung in Knight Library since it opened that same year. The panels, carved between 1932 and 1935 by Clough with assistance from Ross McClure and Jim de Broekert (known collectively as the Grey Gypsy Craftsmen), depict six majestic Cascade mountain peaks, vignettes of Oregon's frontier history, and scenes from Civilian Conservation Corps (CCC) camps. The CCC was a work program that employed more than 2.5 million young men during the Depression years of 1933 to 1942, providing them with shelter, clothing, food, and a wage of $30 per month ($25 of which was sent directly home to their families). In his letter to the UO librarian, Clough describes a meeting of local lumbermen at the grand Osburn Hotel in Eugene, during which Oregon senator Frederick Steiwer '06, who was supposed to speak on the issue of lumber tariffs, instead talked of his concern for the "countless young men" he had seen "train-tramping" as a response to the desperation of the Depression, noting "their bewilderment, their warped outlook, and their seeking a solution by being on the move." The meeting adjourned with no talk of tariffs, but, according to Clough, with an idea to put these men to work building roads, parks, trails, bridges, buildings, shelters, and fire lookouts; fighting fires; digging irrigation canals; stringing telephone lines; planting trees; and other needed improvements. 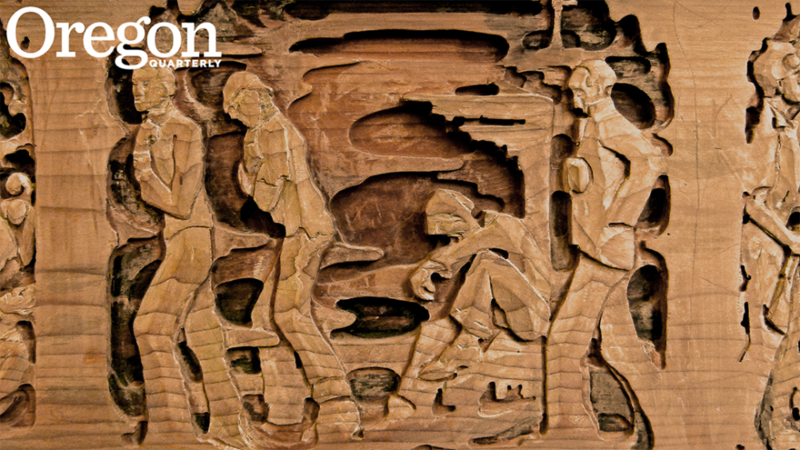 These activities are illustrated in the intricate, nine-foot-tall relief carvings that hang on the east and west walls of the Paulson Reading Room on the library's second floor. Clough (rhymes with "rough" and "tough") was born Harry Arthur Herbert Clough in Madison, Wisconsin, in 1891. He arrived in Eugene in 1924, and made it his home until his death in 1977. An innovative teacher, artist, and designer, his vision helped determine the plans for the Oregon state capitol, and he and his Grey Gypsy Craftsmen produced work that can be found in the Eugene Airport, the Oregon Department of Forestry in Salem, and in schools, lumber offices, businesses, and private homes throughout the Northwest. He understood that learning involves using verbal, numerical, and visual information together. We then use the power of our minds to see the symbols and objects carved in space. This approach is clear in the gestural, somewhat abstract, yet highly narrative carvings in Knight Library. At first look, the panels clearly convey the quintessentially American story of optimism that Clough describes in his letter to Douglass. He writes of his intention to represent this characteristic in murals, recalling how, as he witnessed the senator's meeting with the lumbermen, he was struck with "the idea of portraying the determined trying to find an American way—and the sureness that in every case there is one—which seems to me to be the distinctly American phenomena." A closer inspection, however, reveals another, more intense and somber kind of story. A series of small images runs along the bottom of the panels. Here, we find far darker depictions of the times, stark scenes of the despair and hardship of the Great Depression. The stories were likely gathered from young men, many of whom had traveled from the Midwest and East Coast looking for work, that Clough met at a CCC camp established at Skinner Butte in Eugene. Although Clough did not provide written details of the narratives, research, including that of Kathleen Duxbury, and interviews with some of Clough's descendants, reveals clues to decoding the imagery in these six unusual panels—windows into history, tucked away on the UO campus. Artist Art Clough's full panels, measuring about nine feet high by eight feet wide, are installed at either end of the Knight Library Special Collections and University Archives Paulson Reading Room on the second floor. Each panel features a prominent Oregon Cascades peak—Mount Hood, Mount Jefferson, Mount Washington, Three Sisters, Three-Fingered Jack, and Mount Thielsen—and a band of "fog" depicting stories from the state'spioneer history.Scenes of CCC activities fill the bottom portion of each main image. The small carvings along the panels' bottom edges offer a darker view of Depression-era life. Clough describes how Oregon senator Frederick Steiwer '06, while vacationing at Odell Lake in 1937, was "appalled to note the countless young men train-tramping." Steiwer's concern contributed to the creation of the Depression-era CCC work program. Clough interviewed many workers in the CCC camps; their stories likely informed the images we see in these panels.